Growing up as I did, and as a third-generation Mexican-American, I’m well aware the 60s were a special time in music. Not only because of the creativity loosed upon the world via the British Invasion at the start and explosion of pop culture throughout, but to the overdue impact of Latin Rock by decade’s end. 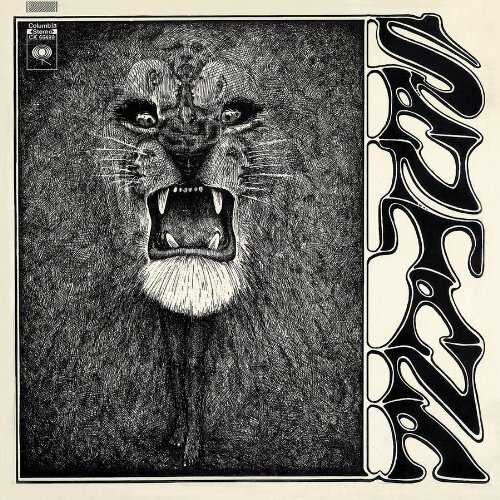 Awash in the beauty and pulse of Afro-Latin music blended with 60s rock, Santana‘s distinct cover art and design helped to manifest that originality. Something not seen prior to this…like ever. There may have been pencil-drawn artwork on other artists’ LPs, but I’d wager none before did it in a way that looked so damn cool or as intriguing. The penned figure of a growling lion stared back into potential listeners eyes with a strange ferocity. Those hooked began to discover the hidden objects nested within the mane, eyes, nose and mouth. The attached title, dipped in graffiti typography, resulted in a trippy album design. One befitting the era and a visual precursor to the new, mind-blowing sound within. As do I ;-). Many thanks for the read and comment, and welcome, Ilene. Great album cover indeed. I love Santana’s guitar work, but I haven’t been able to pick up any of his older stuff for some reason. Oh, yeah. Santana’s guitar work has been quite somethin’. The old stuff is still pretty popular then ;-). Thanks so much, Morgan. Ooh, I like that album cover. and I can listen to Santana anytime. I wish I could play the guitar like that! Even after all these decades Carlos still plays with passion. Thanks, T :-).